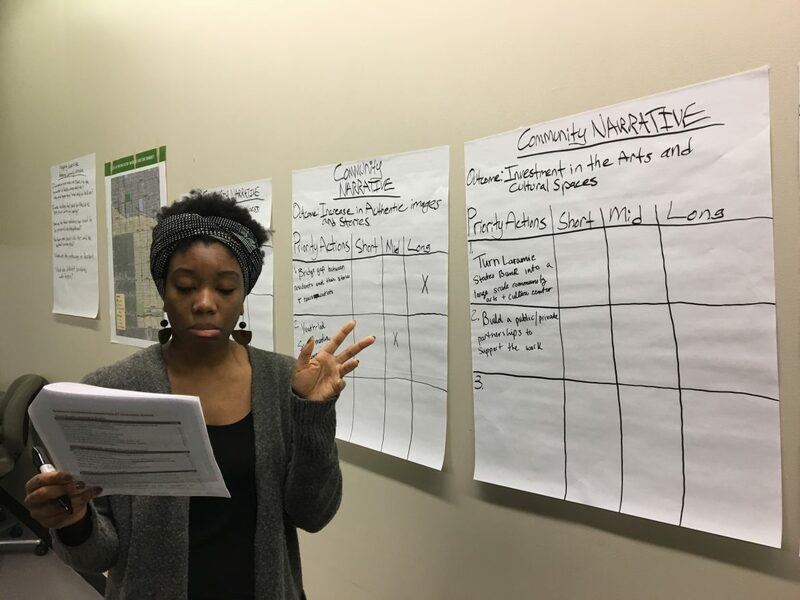 Briana Shields leads a group deciding which proposals to should be pursued as part of a five-year, comprehensive plan being developed to improve Austin. 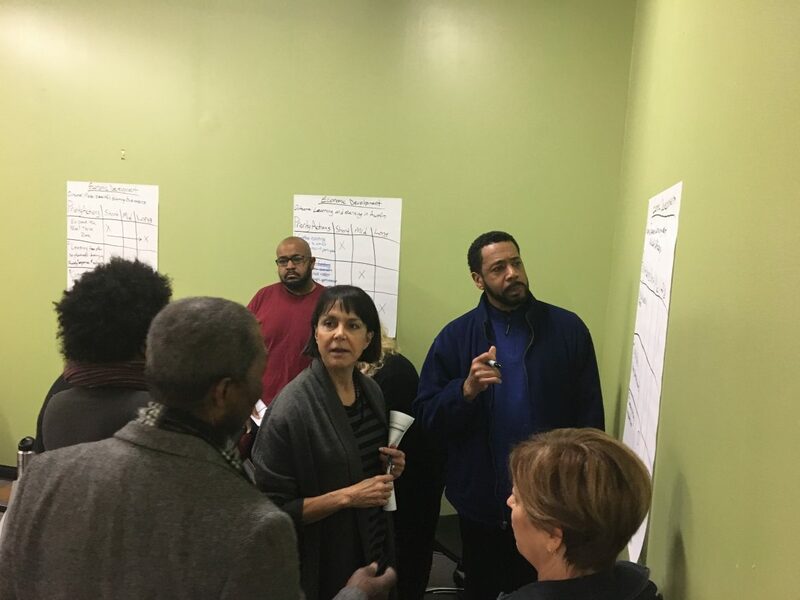 About 30 West Side residents and others working on a five-year, quality-of-life plan for Austin gathered last Wednesday to identify a few key actions to pursue in two areas: economic development and community narrative. Five other working groups covering public safety, youth, education, housing and civic engagement also met last week to determine two to three actions to work on in each of those areas. Last week’s meetings build on a community summit held in December at Michele Clark High School at which about 100 people voted on their favorite proposals to pursue. It was the second of three summits that are planned for the community as it works toward the unveiling of a comprehensive plan in June or July of 2018. The final summit is expected to take place in May. Austin Coming Together is leading the efforts to produce the quality of life plan, which is being backed by Local Initiative Support Corp. Chicago. The year-long process is helping the community agree on the priorities to pursue as well as come up with a specific action plan to improve Austin. Judith Alexander, chair of the North Avenue District and co-founder of North Avenue Neighbors Association, said a top priority should be making sure the Chicago Avenue Retail Zone does well. Gordon Hellwig, vice president of Community Bank of Oak Park River Forest, said financing will be key. Another key part of the community that should be redeveloped is the vacant and deteriorating Laramie State Bank building at the corner of Chicago and Laramie, residents said. Austin resident Briana Shields, who has worked for Austin Coming Together, is especially excited about community interest in developing a food co-op. That will help improve West Siders’ quality of life by providing healthier food choices. Kenneth Varner, a community engagement coordinator for Healthy Schools Campaign, said Austin’s young people should be at the forefront as Austin’s plan is implemented. “The children are the lifeblood of a community,” Varner said, noting that schools are a good place to hold activities like art shows. Jose Abonce, a community organizer for Austin Coming Together who facilitated last Wednesday’s meeting, said the public is invited to participate in any of the seven working groups, which continue to meet. More than a dozen organizations working on Chicago's West and South Sides met last week as part of the initiative "Operation Save Lives," organized by state Rep. La Shawn Ford. “What we have today is a group of organizations and people that are saying that we can help our communities, and we are demanding that the state, the city, the county and the federal government support us,” Ford said.